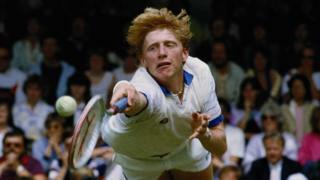 Three-time Wimbledon tennis champion Boris Becker has been declared bankrupt by a London bankruptcy court. The 49-year-old owed a firm of private bankers a large sum and the court registrar said there was not enough credible evidence that he could pay. Mr Becker's lawyers asked for a final chance to pay with the funds from remortgaging a property in Majorca. Mr Becker, now a coach and TV pundit for the BBC and other media, was not at the hearing in London. Registrar Miss Christine Derrett said it was "with regret" that she came to the conclusion that he could not pay. "I remember watching him play on Centre Court, which probably shows my age," she added. In a statement, Mr Becker said he was "surprised and disappointed" that Arbuthnot Latham had chosen to bring the proceedings against him. "This order relates to one disputed loan which I was due to repay in full in one month's time," he said. "It is disappointing that my request for today's hearing to be postponed until this time was refused. My earnings are well publicised and it is clear that I have the means to repay this debt. "The value of the asset in question far exceeds the debt owed to Arbuthnot Latham." Mr Becker's lawyers had asked for another 28-day adjournment after saying that they expected the Majorca property deal to be completed in a month's time. However, the registrar rejected the plea and said: "It is not often the case that a professional person has a judgment (debt) outstanding against them since October 2015. This is a historic debt. Mr Becker's advocate, John Briggs, said: "He is not a sophisticated individual when it comes to finances. I am asking for a real last chance for Mr Becker to come good. It has just taken longer than anticipated." Since retiring from the game, Mr Becker has worked in business and the media and he also coached former world number one Novak Djokovic for three years from 2013. He is part of the BBC's commentary team for this year's Wimbledon Championships, which begin on Monday 3 July.